Oikos of the Olympians, an in-game merchant who offers a pathway for getting premium items for free. The presence of microtransactions in a big video game can poison the player’s experience, leaving them to wonder if things have been designed in a way to drive them to pay extra. So it goes with Assassin’s Creed Odyssey, a very good $60 game that launched with at least $80 in microtransactions. Odyssey’s optional microtransactions, which range from equippable gear, to time-saving XP boosters, to bushels of in-game upgrade materials, have left a sour taste for some. But the people behind the game point out that some of the mechanisms present in the game—and some that are hidden from players—make it so people don’t need to pay anything to get whatever they want. Over the past few days, we’ve been looking over how Odyssey’s microtransactions stack up, and how their presence has (or hasn’t) affected those of us who are playing. We’ve also learned a few things about them from the people who made the game. Odyssey has an in-game store that is laid out similarly to the one in last year’s Origins. It includes more types of items than Origins’, because there are more types of things in the game. All are sold with Helix credits, which basically cost a penny a piece,, though the game offers better and better exchange rates if you buy in bulk. Pay $5 and you get 500 Helix, but pay $50, and you get 7400 Helix. In the shop players can find two outfit sets (500-750 Helix each), eight melee weapons (250 Helix), one bow (250 Helix), and three alternate looks for the player’s horse (500-750 Helix). Players can buy six cosmetic changes for the player’s ship (250 Helix each) and two ship lieutenants (350 Helix each). There are also packs of extra resources used for upgrading weapons or the ship (200-2000 Helix), two permanent boosts to the player’s accumulation of experience points (1000 Helix each), and four maps that reveal the locations of hidden items (300 Helix). Some of this stuff can be purchased in bundles that come at a lower combined price. All of the purchasable items overlap with things you can get just by playing the game. Players can find weapons and crafting resources, obtain alternate looks for their horse or recruit ship lieutenants just by playing normally. While the stuff sold in the store is classified as “legendary,” which is the highest quality type of good in the game, Odyssey doles out lots of legendary grade gear through the course of gameplay. If Origins and the early offerings in Odyssey’s store are anything to go buy, the items that can be paid for might not necessarily be better than the best stuff that can be found in the game, but they will be some of the most creatively inspired or fun. For example, you can obtain some decent alternate looks for your horse by playing normally, but if you want to turn your horse into a winged Pegasus, you’ll have to pay. Origins eventually offered paid-for items like giant Q-Tip weapons and a mummy outfit. Odyssey’s premium items also look to be some of the most exotic items made for the game. While store items won’t drop from chests or fallen enemies like standard in-game items, you can still get them without paying. Like Origins before it, Odyssey contains randomized lootboxes that can only be obtained by playing the game and that have the possibility of giving players an item from the store. In Origins, those were called Heka Chests. In Odyssey, they’re called Olympian Gifts. They look like vases. All outfits, weapons, horse looks, and ship upgrades in the store can be obtained from an Olympian Gift, a Ubisoft rep told Kotaku. The paid-for XP/money boosters and special maps can’t be. And in a change from Origins, the Ubisoft rep said that items will be put into the randomized Olympian Gift rotation the moment they go live in the store. In Origins, there was sometimes a delay of several weeks, during which time, if you liked a new premium item and wanted it right away, you had to pay for it. Origins’ presented its Heka Chests as prizes offered by a boy named Reda who would spread out a carpet and encourage players to go on new, daily quests. The reward for those quests was a Heka Chest, though players could also buy the chests with in-game gold that was obtainable by playing the game normally. Odyssey offers its Olympian Gifts through a merchant named Oikos of the Olympians, who also sells a changing selection of mid-quality items. He sells all of that stuff, including the Gifts, not for the in-game gold that players get by questing, killing and looting, but for turquoise rocks called Orichalcum Ore. That Ore is far more rare than in-game gold. Players can collect 10 Ore by completing a daily quest (there to be two offered per day), 40 for completing a weekly. There are also about 600 individual deposits of Ore scattered in the game world (In 25 hours of playing, I’ve found three and picked up 10 more by doing a daily quest.) The individual items sold by Oikos range in price from 20 to 100 pieces of Ore. The Olympian Gifts go for 20, or the payout of two daily quests. The new Orichalcum economy, at least at launch, slows down the pace at which it’s possible to obtain the game’s lootboxes. While an Origins player could get a Heka Chest each day by doing a daily quest, an Odyssey player has to do two dailies or get Ore through additional means. Origins players could splurge on more Heka Chests by spending more in-game gold, whereas Odyssey players need to work harder to collect extra Ore. The player’s character even complains about this economic system, asking Oikos why he won’t just take gold. A Ubi rep acknowledged that “it might take a bit longer to unlock Olympian Gifts than the Heka Chests in Origins,” but described the switch from using regular in-game gold to a special ore as “a great way to reward the most engaged players while encouraging others to regularly come back to Assassin’s Creed Odyssey to discover the most recent changes and additions we’ve added to the experience.” In other words, if Odyssey’s newly-added, abundant timed bounty missions weren’t already a clear indication that Ubisoft wants to incentivize players to turn on this Assassin’s Creed more often, the Orichalcum Ore should be. Ubisoft’s PR rep also teased that there will be more ways to obtain Orichalcum Ore in the “next few weeks,” noting that these activities “will make gathering it quicker and the challenges to earn them even more varied.” If that’s the case, getting Ore to open one or more Olympian Gifts per play session will hopefully become a lot easier. It’s nice to know that the randomized lootboxes in Origins and Odyssey can contain premium items, but if the odds of them doing so are low, it’s not much of an offer. Ubisoft did not provide specific numbers for how often the Olympian Gift lootboxes pay out a premium item, but a rep did say that the “the base chance at obtaining a premium item is greater than it was in Origins.” Ubisoft also says that Origins and Odyssey’s lootboxes both raised the chances of a player getting a premium item with each successive opening. A rep added that there were several other improvements made to Olympian Gifts compared to Origins’ Heka Chests: premium items found in Olympian Gifts will never repeat; they’ll be usable across multiple playthroughs; any bundles in the store that contain an item a player obtained through an Olympian Gift will drop a bit in price to account for the item the player already has. Assassin’s Creed games have always offered maps that show the locations of treasure chests and other valuable collectables. Back in the old days, you could get those maps just by playing the game. (Or, you could skip getting the maps and just find stuff by exploring.) Origins made those helper maps premium items, selling them for $2. Odyssey sells its maps, which separately show the locations of First Civilization Steles, Ancient Tablets, Legendary Chests and Orichalcum Ore pieces, for $3 each. The $1 price increase, a Ubisoft rep said, is because “each in-game map time-saver unveils more secrets and ultimately gives out more rewards than any of the equivalent maps that were present in Origins.” They pointed to the Orichalcum Ore map, which shows the location for more than 600 pieces of ore, and noted that that “can be turned in for premium items that are worth more than the map itself”—presumably based on the idea that the 60 Olympian Gifts players could buy with 600 pieces of Ore would pay out more than $3 worth of store items. Game developers have long used the chance to get extra experience points to excite players. Online shooters will have double-XP weekends, for example, and a special $80 version of Assassin’s Creed Odyssey was bundled with, among other things, a temporary XP and in-game money boost. Odyssey’s shop also includes permanent boosts to XP and money. These have been the most controversial offerings in the store. Some players have noted that the boosters might simply make the game more fun, as earning XP faster lets players unlock more skills faster, which in turn lets them engage in more varied combat scenarios. Leveling up faster also opens up more areas of the world to explore more quickly, as the toughness of higher-level enemies is the main thing constraining players’ movements in the first few hours. And some have theorized that the game’s unexpectedly stiff difficulty, including the fact that enemies will often level up as your own character levels up, are a sign that Ubisoft engineered some frustration into the game in order to drive people toward buying the boosters. Staff at Kotaku who have played the game on Normal and Hard have found Odyssey challenging but not so tough as to need permanent boosters to play or even have a good time. Some of us have had a harder time with naval combat, where your odds of survival are governed not by gear and abilities but by upgrades purchased with resources that, yes, are sold in packs in the game store for players who don’t want to scavenge for them. Even there, we’ve gotten enough upgrade materials through the course of regular play (and dismantling lots of the gear we find) to get over the difficulty curve without paying extra or even needing to go farm for upgrade materials. “About the player experience in itself, we set out to create an epic RPG adventure, a true Odyssey that spans many hours and often isn’t a trip directly from point A to B. We want the player to experience a journey into the unexpected involving many characters, stories, regions, choices and challenges. “True to the game’s full-on RPG nature, we offer a huge amount of content to players at every level of progression. Sometimes that content can be too high level for the players’ current state. Challenging the player with higher level content at the end or beginning of a new region is a core part of our design. That design is to give players a challenge in front of them that can be defeated with skill and perseverance, but we suggest and prompt the player to take advantage of other content around them in order to level up, gear up, and power up with new abilities in order to overcome this challenge (ie. taking World and Character quests, engaging in Conquest Battles, completing Bounties and Contracts, fighting in the Arena, or completing POIs). We think this type of challenge will encourage players to explore the vast world we have created and find some of the best content the game has to offer. We feel strongly that by creating peaks in our challenge curve, we create more memorable moments, more player autonomy, and more satisfaction in their overall experience than if we were to balance the player experience pacing to make it completely smooth or too easy. For some players, the presence of microtransactions in a $60 game is intolerable. For others, there’s at least a right way and a wrong way of doing things. 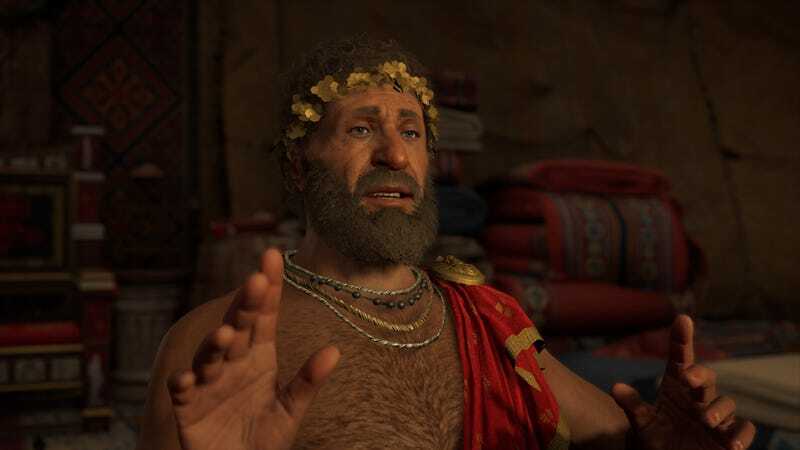 Ubisoft’s approach with Assassin’s Creed Odyssey’s microtransactions seems mostly geared toward catering to players who want shortcuts, and who don’t want to wait out their chances to get premium gear for free. Without knowing the rate at which store items drop from the Olympian Gift lootboxes, players will continue to lack crucial information about the truth of Ubisoft’s “get-the-cool-premium-stuff-without-paying-extra” pitch.Because of that, a whiff of manipulation will continue to accompany this generally excellent game. But the numbers behind the system will become more clear over time, as people keep playing and sharing their experiences. It may turn out to be an okay deal after all, but it’s impossible yet to say.